So as busy as life has been lately, I ALWAYS make time to sew something! I needed a quick fix and this pattern had been in my "to-sew" stack for a while. So I got going on it. I cut view A. As many other reviewers have stated, this patterns run BIG! Like seriously huge! I would normally cut a size 16 in a jersey dress like this, especially since it has pleats and pockets. I like to insure that everything lays properly. But this time, I cut the 14. And I still could have cut a 12 on top. I had to nip and tuck at the bodice. And a FBA definitely was not necessary. When I measured from the waist to the hem, I was good with the length out of the envelope. So I didn't have to make any lengthening alterations. I skipped all of the bias binding. I can't figure out why all of that was needed. I used a 5/8" hem allowance and kept it moving. I used this satiny jersey fabric I found at Hancock. I feel in love with the bright neon yellow color and thought it would be perfect for spring. I thought the poly-jersey would be a nightmare to work with, but it wasn't . I had not problem sewing it with my ballpoint needle. And it pressed fine. Disclaimer: My iron will beat any fabric into submission! If it weren't for the fact that I bought 11 patterns from the new Vogues that were just released, I'd might consider sewing this one again. But alas, there are only so many sewing hours in a day! I also made my way to Target this morning for the Jason Wu for Target sale and scored this really cute black trench coat for $55. Just like when the Missoni for Target was released, again I heard about chaos ensuing with shoppers and resellers in the stores. Well, we Southerners are truly lady-like and laid back. Because when I went to Target at 9 am (an hour after the store opened), there were less than 10 people in the sportswear department. And there was definitely no foolishness. I bought the trench, a scarf and a clutch purse (I'll show you those later). I looked at the dresses and skirts. They were too "cutsie" for me and definitely too short. Congrats to the Super Bowl Champions New York Giants! Wow...I think your dress looks much better than the pattern illustration...great job!! Nice combination and trench score! I like the length you have here on the dress. The pattern illustration seems longer and not as proportionally interesting (to me). Amy, I like the above the knee length too. Thanks! Another pattern that I hadn't given a second thought to before seeing your version, I'm going to wait to see what you do with the new Vogues before deciding which ones to order! Love the yellow on you too. Allison, hopefully I can get one of the new ones sewn this week! Congratulations! Yellow is not an easy colour, and still it looks amazing on you! The whole combination is perfect. 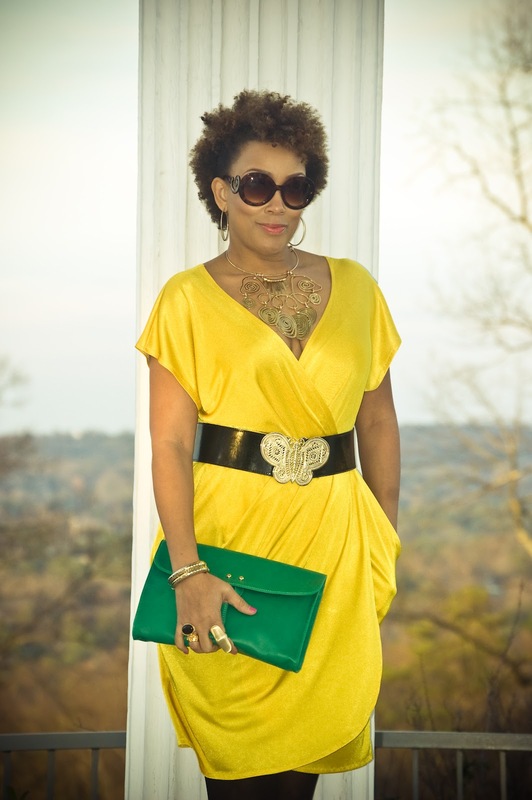 Merche, I think yellow looks amazing on almost all women of color! Thanks! You look marvellous in this! You are really making yellow look good. The trench is fantastic, too. Just perfect for spring. Karin, I can't wait for spring so I can combine it with other bright colors! I bypassed this originally because I had made one similar but didn't like the ties on the back. This looks fabulous on you so I think I will look at it again for the summer. The belt really sets it off. I don't think I could pull yellow off though (red hair). Very pretty dress and the trench is perfect with the dress. Great job. Lady you are rocking that yellow dress! Love the shimmery color! Great score on the jacket and other accessories. Another winning outfit.. Love that yellow on you. I just LOVE this dress! What a fab colour! I love how you paired it with the green handbag! Lovely dress and perfect with the coat. I am sooooo jealous of the Jason Wu score! Here in my corner of the world - that stuff is gone an hour or two after the store opening. The dress and jacket are perfect together...simply lovely! Carolyn, I hear about how they get down in the NYC! Thanks! Great dress and love the color! I'm trying to get myself to think spring so seeing these outfits, gets me going. Denise, since we still haven't really had winter, it's not hard to get in a spring state of mind! Thanks! Beautiful, beautiful work! I forget you have a blog (probably because I lack sewing skills). YOU LOOK AMAZING!!!!!!!!! I love the two colors together. I'm going to try this. I love this! And you look stunning in it! I'm normally a neutrals kind of gal - but seeing this makes me want to wear COLOUR! Only, being blonde, I don't think this shade would suit me. Lovely to see it on you, though. Thanks. Wow, that dress is really fabulous. A great outfit! Lovely! Yellow is a great color on you. That necklace...droool. Thanks Narcissaqtpie! The necklace was a gift from the husband! All I have to say about your look, and I mean this with much love, ugh Whatever!!! LOL Work it gurl. Wow! I love this dress. You look stunning. I might have to try this pattern. Thanks for the tips about sizing. Beautiful Dress! I enjoy reading a post that will make people think. I do believe that this certain blog was ever most useful in my adventures of blogging. Ever more I think everyone should know and learn the information posted. Wow, fabulous dress. Love the color on you. And as yellow is such a big trend for spring/summer your totally fashionable. What I'm Wearing | A maxi dress in winter! What I'm Wearing | Red with Neutral & Gold!